The US House has passed a resolution calling on President Barack Obama to send lethal weapons to Ukraine, despite the fragile truce in the eastern part of the country. The non-binding resolution was approved by an overwhelming majority of 348-48. It comes as the White House is unwilling to make any radical moves on Ukraine, and follows German Chancellor Angela Merkel’s efforts to persuade Obama to commit to Ukraine’s truce plan during her February visit to the US. Back in September, Ukrainian President Petro Poroshenko requested Congress to authorize a delivery of US military equipment to the Ukrainian government. So far, Obama has only signed off on non-lethal aid and sanctions against Russia – which Kiev and Washington claim is involved in the conflict, despite giving no evidence to support the notion. 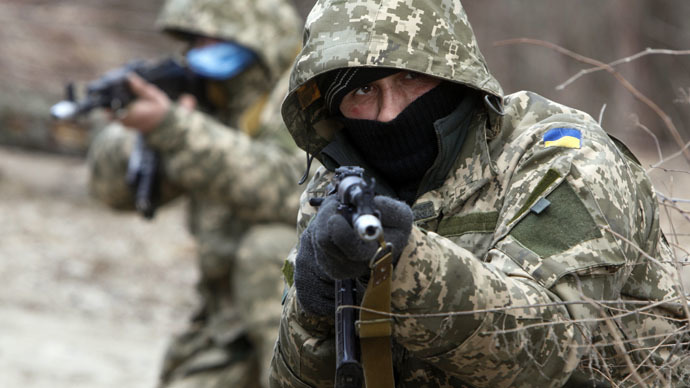 The Ukrainian military launched an operation in the country’s southeast last April, after the Donetsk and Lugansk regions refused to recognized the new authorities in Kiev which were installed during the February 2014 coup. The death toll in the Ukraine conflict has exceeded 5,800 people, many of them civilians, while another 14,000 have been injured, according to a February UN report. The Donetsk airport has remained a battlefield in the conflict since May 2014. The international airport – which used to handle some five million passengers annually – now lies in ruins. The Donetsk region witnessed daily shelling before the latest Minsk ceasefire agreement on February 12. Civilians were killed when shells hit residential buildings, schools, hospitals, and public transport. Pro- and anti-government forces also fought around Debaltsevo, a strategic railway hub connecting the breakaway regions of Lugansk and Donetsk. Last week, Russian Foreign Minister Sergey Lavrov called on Germany and France to take action against Kiev’s non-compliance with the Minsk peace agreement. According to Lavrov, Kiev didn’t make an effort to start dialogue with the self-proclaimed republics of Donetsk and Lugansk on the modalities of elections there. Moreover, Lavrov said on Saturday that the EU would not comply with Kiev’s request to send a peacekeeping force to Ukraine unless the rebels endorse such a mission. “I believe there are no madmen in the EU. [The EU previously deployed peacekeepers] only in situations in which, as in the Balkans, all sides of a conflict agreed to it,” Lavrov said in an interview to Rossiya 1 channel. UK military personnel have arrived in Ukraine and are beginning their training mission there, Britain’s Ministry of Defence announced last week. US training will begin in April, as America has committed nearly 300 paratroopers to the mission. Russia has supported the Minsk peace plan and has been vocal in its opposition to sending lethal aid to Ukraine. Washington's decision to supply Ukraine with ammunition and weapons would “explodethe whole situation” in eastern Ukraine and Russia would be forced to respond “appropriately,” Russia's Deputy Foreign Minister Sergey Ryabkov said at the end of February. “It would be a major blow to the Minsk agreements and would explode the whole situation,” TASS quoted Ryabkov as saying.